this week our lovely guest star ♥June Houck♥ is channeling elvis' "BLUE CHRISTMAS" ... so we're asking you to create your cards this week using blue as your main color. 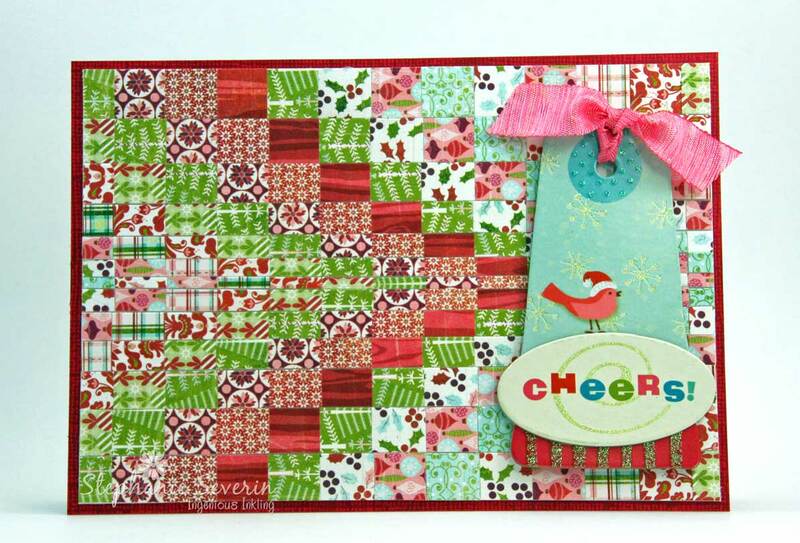 June says, "I came up with this idea during Jingle Belles' Recycle, Re-use and Jingle challenge. My card that week used a blue paint chip from Home Depot and I had Elvis' "Blue Christmas" stuck in my head. 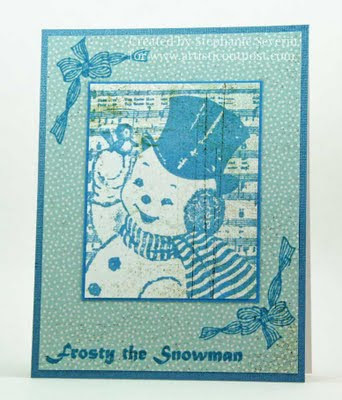 I recently was re-organizing my Christmas-themed papers and embellishments and came across a set of vintage post cards that I have owned since 1989, but I had NEVER used. 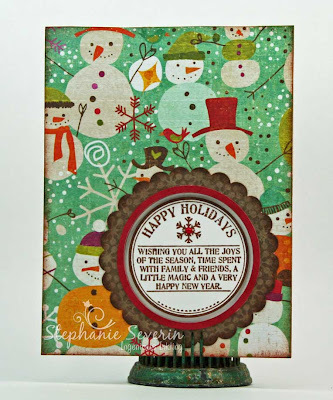 I remembered seeing this card on Lauren's blog; her card was just the inspiration I was looking for! I fell in love with the sapphire blue of Santa's suit." Stephanie says, "I think blue is the perfect color palette for Frosty... and how could you possibly be blue with that cute little face smiling back at you??" so now it's time to see what you will do: sapphire, robin's egg, cerulean or baby blue? elegant, whimsical, fancy or fun? 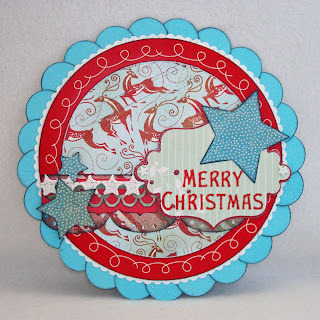 stamped, diecut, painted, collaged... or all of the above??! 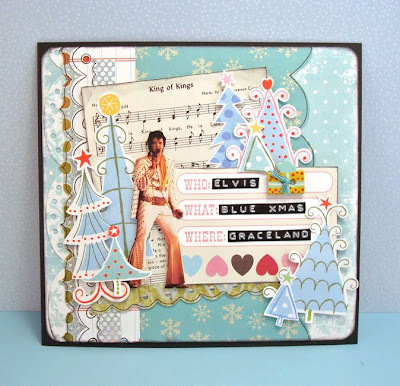 turn up your elvis records, turn on your mojo, and get crafty with BLUE CHRISTMAS! inlinkz will be open until 6pm EST next wednesday, august 3rd. the keyword for galleries or our flickr group is JB31. Ros says, "You just gotta love those penguin faces ... so clever and such fun!" Ros says, "No favouritism honestly! 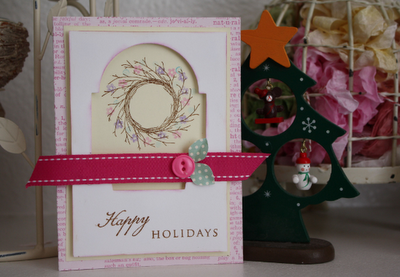 I love that she used such pretty colours and a totally different shaped aperture for her wreath!" Ros says, "I *LOVE* the perfectly clean and simple look of this!" again we thank every single ♥BELLE♥ who participated, and offer an especially large thank you to the wonderful ros crawford for coming along this week and being a huge help as well as an incredible inspiration. 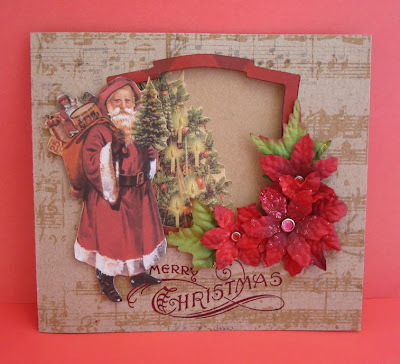 do be sure to check out the amazing creations on her blog, mikey's mom and remember that she's one of the lovely hostesses over at city crafter challenge blog where they are wowing us every tuesday with a new idea and some fabulous designer eye candy! hello, it's lauren here, bringing you the new prompt, and you'll have guessed i am over the moon with delight already... just from the title! 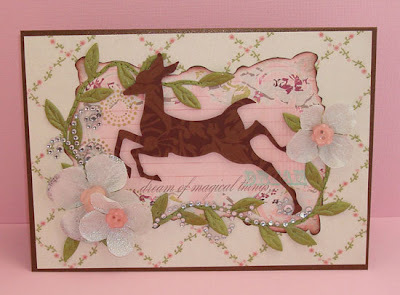 it comes from your very generous and very clever fellow ♥BELLE♥, this week's lovely guest star ros crawford! you may recognize this talented papercrafter from her participation here and at many other crafty challenges where her creations never, ever, fail to impress and delight. 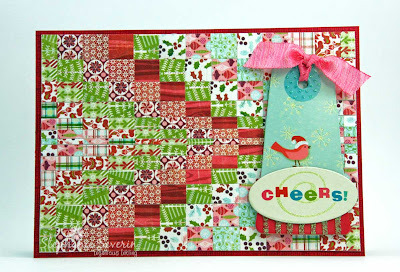 she's also a designer at the fabulous city crafter challenge blog, where a new theme debuts every single tuesday! ros came up with an absolutely terrific idea for this week--to make aperture (or "window") cards--during a little bout of insomnia she suffered recently. whilst lying awake in bed, her mind was filled with holiday card-making ideas, which she was generous enough to write in* and share with us. (for which we are very grateful!) oh HOLE-y night caught our imaginations immediately, both for the clever pun AND the interesting construction challenge involved! Ros says, "The card was created with MME Christmas glitter paper stitched onto kraft ... To make the circle "window" I cut through all layers with Spellbinders Nestabilities standard circles ... made a frame for the hole with the SB scalloped circles I used some acetate with a criss-cross design in the aperture and adhered this in place to the back of the kraft cs before adhering to the card base ... Then I made a 3D bauble (again from scalloped circle nesties) and adhered this to the 'window' ... 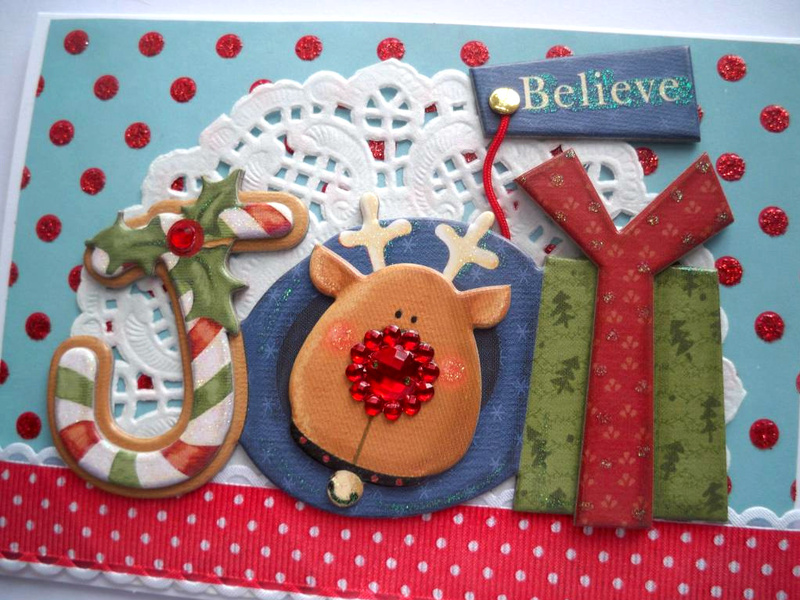 Stamped a sentiment from a WaltzingMouse stamp set and added a generous dollop of glitter .. a ribbon and some leaves and berries ..."
Stef says, "My card is pretty straight-forward this week made with my circle cutter & lots of circle punches ... I wanted to let those sweet snow people shine. 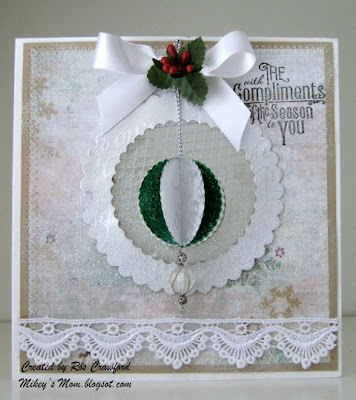 I did punch a scalloped circle and small circular ring to frame the circle on my card front ... paper is Crate Paper's Snow Day Collection and the sentiment is a favorite from CatsLife Press. This will be one of the many masculine holiday cards I need to have in my stash." so put on your thinking cap... get out your punches, dies, scissors or craft knife... and start plotting how you'll interpret oh HOLE-y night! (there are excellent tutorials here & here if you need some more ideas.) your "window of opportunity" lasts until 6pm (EST) next wednesday, july 27th. keyword for galleries or our flickr group is JB30. have fun! *if you have a great prompt idea in the middle of the night--or at any other time--why not email us at jinglebellesrock @ hotmail [dot] com and share with us? we'd love for ♥YOU♥ to be our next lovely guest star! 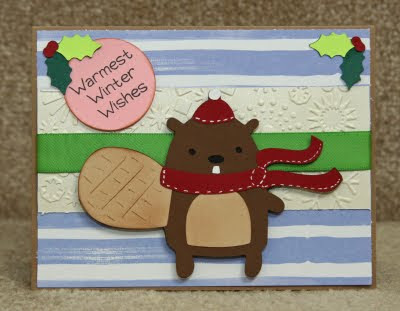 Seriously ... how could we not feature this adorable beaver all dressed up for winter in his warm little scarf and hat ... and we love the texture on his tail ... cute cute cute. 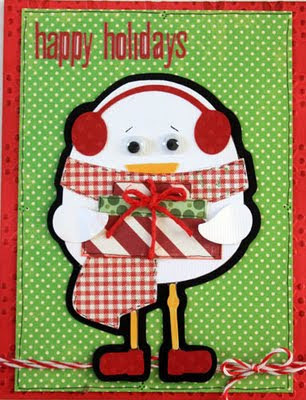 made a fun little paper-pieced holiday bird with great googly eyes and knobby little knees ... and love those ear muffs. turned her clever little reindeer into a perfect "O" ... and how awesome is that super-blingy rudolph nose! 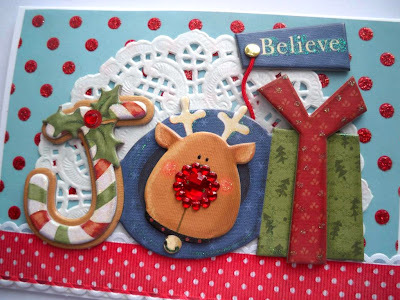 Make sure you take some time to visit the links in this week's gallery & leave a little jingle belle love ... there are lots of fabulous designs to inspire you. And check back at midnight ... we're excited to share another lovely guest star & a great prompt to keep those holiday cards stacking-up. 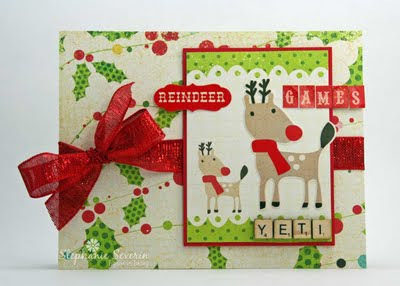 This week at Jingle Belles we're playing Reindeer Games ... and everyone gets to join the fun. 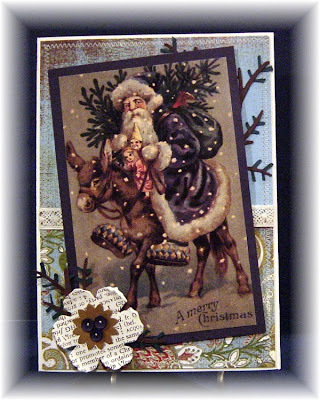 The prompt is to use a reindeer (or any other holiday animal) in your card design. Stef says, "When I was thinking about my card, I couldn't get the silly image out of my head of Reindeer playing Monopoly or Scrabble. One of my favorite ways to spend a weekend afternoon is playing Scrabble on-line with my sister ... her go-to word is often YETI (usually with a triple word score), so this card is for her. Papers are from Echo Park's Everybody Loves Christmas Collection"
Lauren says, "it's not as if i don't have ENOUGH holiday papers and accoutrements to wallpaper the entire northeast, but for some reason, on this card, the only "holiday" item is the tim holtz diecut reindeer. everything else is from my "regular" stash and was truthfully mostly leftovers and scraps including the michaels-special silver flowers (purloined from my aunt! ), my beloved may arts leafy ribbon, and the journaling card of unknown origin whose awesome sentiment "dream of magical things" inspired the entire card!" Remember, you don't have to use an actual reindeer, it's sort of a coincidence that we both did! In fact, any critter or animal that you like, with a holiday theme, will work: penguins, moose, polar bears, mice, monkeys, birds ... be creative, HAVE FUN and let's see your best REINDEER GAMES cards back here before next Wednesday, July 20th, at 6pm (EST). The keyword for galleries or our flickr group is JB29. The Most Crave-able Leftovers Ever! Holy Wow, ♥JINGLE BELLES♥! We thought it would be quite the challenge using scraps and offcuts to make amazing Holiday Leftovers cards, but clearly it was no problem at all for you everyone! 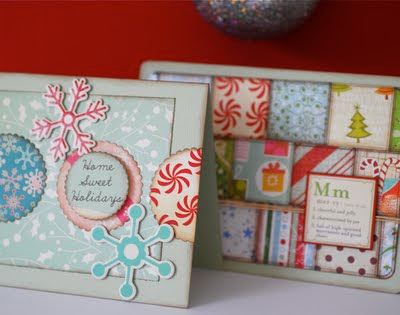 Some of the best cards of the year were inspired by little bits and bobs that you Belles found laying about. Here are a few cards we found especially awesome this week! 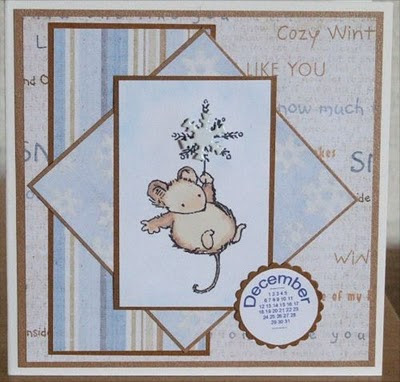 Based her "scrappy" card around a beautifully stamped and colored Christmas Mouse! Raided her "Shoebox of Stuff That Will Be Useful Someday" to retrieve nearly all of the pre-assembled parts of this lovely card ... she only had to stamp a sentiment! Made not one but two simple cards ... that are each simply perfection! 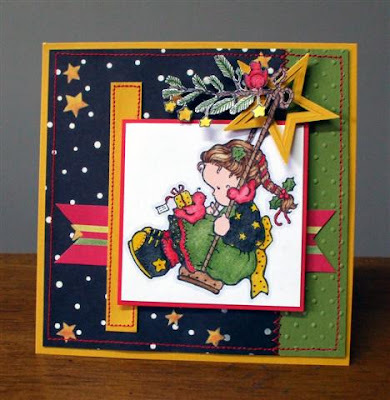 Many thanks to *ALL* of you lovely cardmakers who came along and had a go! The gallery this week is even more than usually ♥FABULOUS♥ ... which you'll realize is really saying something in these parts! A brand new, super-fun prompt goes live at midnight, we hope you'll come back and check it out! One of my favorite things about the holiday meal is the leftovers ... I always enjoy adding a little stuffing and cranberry sauce to my ham sandwich. So this week at Jingle Belles, we're celebrating Holiday Leftovers. We're asking you to create a card using all of those little leftover pieces of paper, alphabet letters, stickers, ribbon ... you know, those things you save because they're just too cute to throw away. 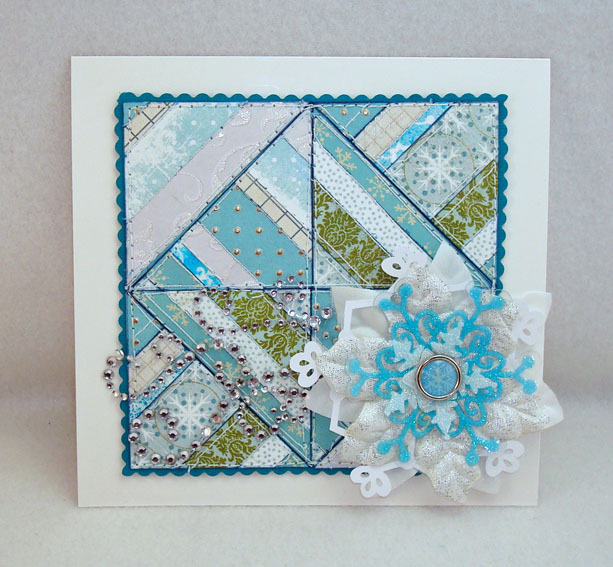 Lauren says, "i'm always inspired by the cool techniques quilters use to make amazing art from scraps, and i often lift & interpret sewing ideas on my cards. this time i went completely literally and made a small paper version of a string pieced quilt, using nothing but tiny strips of paper from my scrap box. 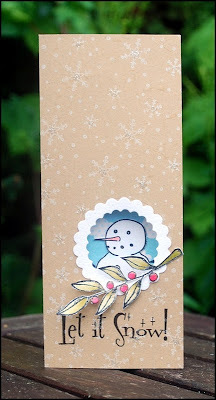 there's a little step-by-step illustration... and a second card made with this method... on my blog!" 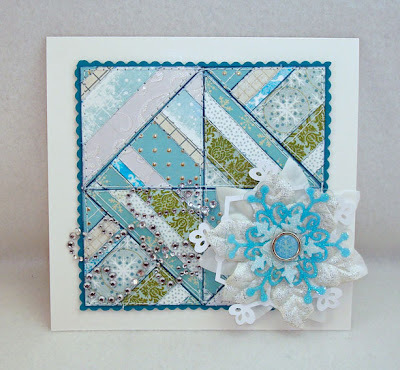 Stephanie says, "I used my paper scraps from Basic Grey Eskimo Kisses papers to create a card using the Paper Bargello Technique (my tutorial here). I remember the first time I saw this technique on the Carol Duval show many years ago and was completely fascinated by the effect. 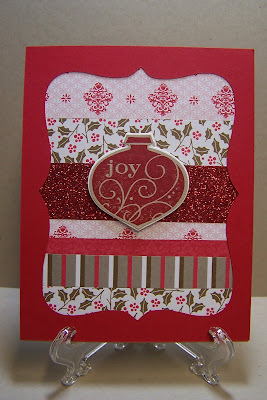 Once I finished my card front, all I needed was a chipboard sticker with some ribbon to finish the design. So go forth and find those neglected leftovers and turn them into a holiday masterpiece ... we can't wait to see what you create. InLinkz will be open until 6pm EST next Wednesday, July 13th. keyword for galleries or the jingle belles flickr group is JB28. 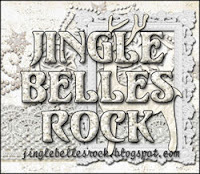 It's been another rockin' week at jingle belles. We were so inspired by the many different ways you incorporated Stars OR Stripes into your designs. 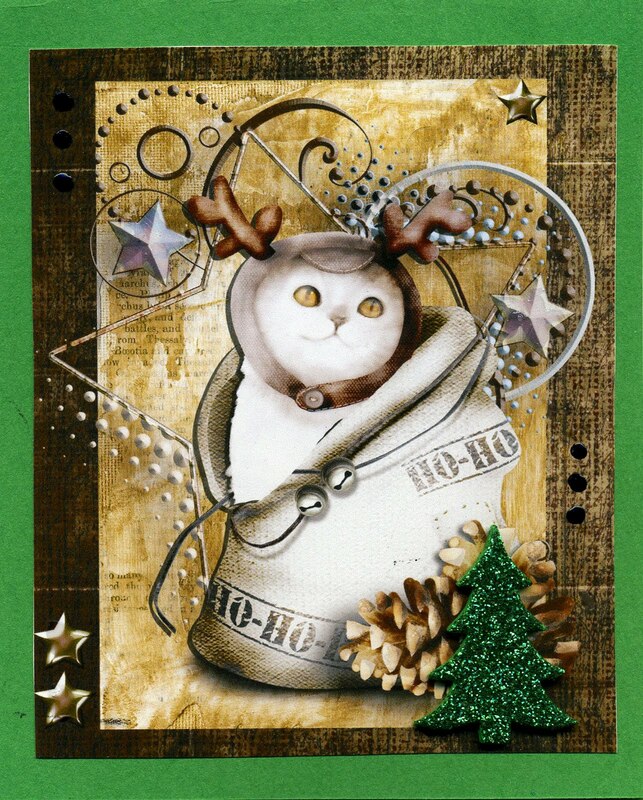 and seriously, who can resist that sweet reindeer cat? not to mention the sweet little stars scattered throughout the card. stitching is such a great touch ... magical. If you haven't skipped through the Stars OR Stripes gallery and shared a little jingle belles love, please take some time to check it out. And don't forget, another wonderful prompt for you at midnight tonight. here in the USA this weekend is, of course, the big holiday of the summer, so while we hope every single one of our fellow ♥JINGLE BELLES♥ will have a very happy forth of july on monday, we'd also like to wish our american friends a happy independence day as well! this week, in honor of that holiday--and as you may have already guessed from the title--we're asking you to incorporate either stars OR stripes into your card design. there needn't be any red, white, or blue... just stars or stripes... or both... in any medium you choose! 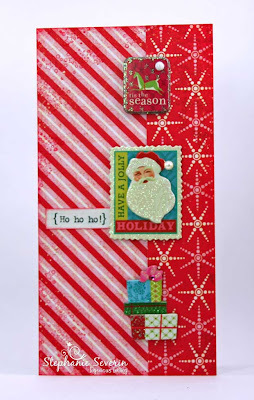 Stef says, "I combined the candy cane striped paper from Echo Parks Everybody Loves Christmas with the snowflake paper that reminded me of stars. I added three glittery stickers for this week's Sketchbook Saturday Sketch. 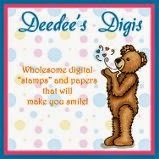 I finished with a CatsLife Press sentiment flag and a stamped border of tiny stars around the striped panel." Lauren says, "i realize i just confirmed there is no need to use red, white or blue... and you don't need to have stars AND stripes... one or the other is GREAT! but i decided to go whole hog, and seeing as how i still i have little stash of well-loved basic grey "blitzen" papers, it was not hard to pull off! i also used last week's sketch #84 from cards & things challenges, which i totally adore, so this week was a breeze!"